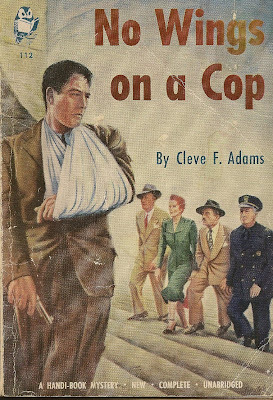 Like SHADY LADY and CONTRABAND, NO WINGS ON A COP is another novel published under Cleve F. Adams’s name that was actually expanded by Robert Leslie Bellem from an Adams pulp story into a novel. Bellem and Adams were good friends, and I seem to recall reading that Bellem wrote those novels as a favor to Adams’s widow. Of course, I imagine Bellem got a cut of the money, too. If I’m wrong about any of that, I hope someone who knows more about the situation will correct me. Also, I’m not sure which Adams story served as the basis for this book. It might be “Clean Sweep”, from the August 24, 1940 issue of DETECTIVE FICTION WEEKLY, which, according to the Fictionmags Index, features police lieutenant John J. Shannon, the hero of NO WINGS ON A COP. If anyone knows for sure, again please let us know in the comments. With that bit of background out of the way, how is NO WINGS ON A COP as a novel? Pretty darned good, that’s what it is. When the story opens, Lt. Shannon’s boss and good friend, Captain Grady, has already been murdered, and the killing has been pinned on gambler Floyd Duquesne, who evidently had been paying off Grady for protection. Shannon doesn’t believe that his friend was crooked, of course, and sets out to find the real killer. Almost as soon as he begins his investigation, though, somebody plants a bomb in his car. Shannon survives the explosion, but his left arm is broken, so for the rest of the book he’s going around with his arm in a cast and a sling, which proves pretty inconvenient at times but ultimately comes in handy on at least one occasion. All the action in the book takes place in less than twenty-four hours, and it’s a whirlwind pace, as you might expect. Shannon clashes with the acting chief of police (the regular chief is out of town), gets kicked off the force, gets hit on the head and knocked out, trades banter with his girlfriend, who’s a beautiful model, has a couple of shootouts with hired killers, has a beautiful redheaded stripper try to seduce him, and runs up against an assortment of crooked cops, corrupt politicians, big-time gamblers, and dangerous hoodlums. It’s all great fun, with a complex plot that Shannon finally sorts out at the end. 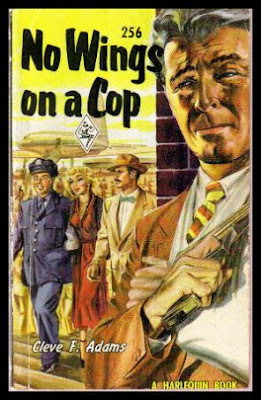 I’ve been reading this sort of hardboiled detective novel for more than forty years now and still get a big kick out of a good one, which NO WINGS ON A COP certainly is. Bellem’s writing is as smooth and fast and enjoyable as ever, and knowing the background of the book’s authorship gives it an added level of humor. There’s a mention of a cab driver reading an issue of the DAN TURNER, HOLLYWOOD DETECTIVE comic book, some of the characters sit around and drink Vat 69, Turner’s favorite hooch, and Bellem even writes himself into the book as a character, bank officer Robert B. Leslie: “The guy was a middle-aged man with slightly wavy hair, a thickening middle and a mustache of which he seemed inordinately vain.” Although Adams might have been responsible for some of that in the original story, I don’t know. He and Bellem were friends, after all. NO WINGS ON A COP was originally published by Handi-Books in 1950 and later reprinted by Harlequin. As far as I know, it’s been out of print for more than fifty years now, and it ought to be a prime candidate for reprinting by one of the small presses. This is one of those books that sat on my shelves for years without me getting around to reading it, then was lost in the fire. I replaced it not long ago and decided that I’d better get it read. I’m glad I did. Highly recommended. I have both editions of this book too. Since Shannon is still a cop in this story, it's considered a prequel to the novel The Private Eye, when he goes, well, private. I don't know which pulp story this is based on, but I'm betting Steve Mertz does. Maybe he'll drop by and enlighten us. Between you and Evan, I am really motivated to read some Cleve F. Adams! Me too! Great review, James. Sounds like my kind of book, written by my kind of writers. At the paperback show in March I bought THE VICE CZAR MURDERS, which I believe was also partly written by Adams, partly by Bellem. Haven't read it yet. James, if memory serves, you got VICE CZAR for Christmas, right? I assume you haven't gotten to it yet, or you'd have blogged about it. But if you indeed have read it, how does it stack up to NO WINGS? Dave, the same question regarding VICE CZAR is directed to you, too, if you don't mind. I suspect you know my answer to that one, Rittster. I read it 20 years ago, no doubt liked it, and remember nothing more. I've been planning to reread and review it, though. I have Adams' original story "Song of Hate" from Double Detective, and hope to compare it the hardcover version to see what changes Bellem made. I'll probably do the same thing with Contraband. I haven't read THE VICE CZAR MURDERS yet, but I'll get to it eventually.